The peaceful demonstrators sentenced to administrative detention in Minsk were held in conditions that are contrary to the state’s obligations enshrined in the Constitution and international treaties. Such conditions of detention are a form of cruel, inhuman, and degrading treatment prohibited by the International Covenant on Civil and Political Rights and the UN Convention against Torture and Other Cruel, Inhuman or Degrading Treatment or Punishment. Description of detention conditions and statistical information are resulted from the processing of interviews with people who requested assistance from the legal advice office of the Human Rights Center "Viasna". In total, the study provides data collected from 130 people who served various periods of administrative detention between March 15 and April 19. Administrative detainees were confined to the Center for the Confinement of Offenders of the Main Department of Internal Affairs of the Minsk City Executive Committee (hereinafter referred to as the CCO), with part of them serving their sentences in the neighboring temporary detention facility of the Main Department of Internal Affairs of the Minsk City Executive Committee. Sixty people were transported to the temporary detention facility in the city of Žodzina. The interviews were conducted according to a previously prepared methodology: a questionnaire designed for a comprehensive study of the legislative and law enforcement aspects of administrative proceedings. - possibility of exercising the right to appeal a court ruling. In 83% of cases, in violation of internal regulations, the administrations of places of administrative detention did not notify the citizens of their rights and duties, rules of detention, procedure for filing motions, proposals, applications and complaints, or did it formally, as a result of which the detainees had difficulties understanding their rights and obligations (9%). When admitted to the detention facility in Žodzina, the rights were not explained in 60% of cases. The rights were incomplete and unclear for 10% of interviewees. Of great concern is the token approach of the administrations of places of detention to the procedure of medical examination of admitted detainees. 33% were not subjected to medical examination, 23% were interviewed by a medical professional. Due to the continuous admission of peaceful protesters, the administrations of places of administrative detention violated the procedure of medical examination or did not perform it at all. 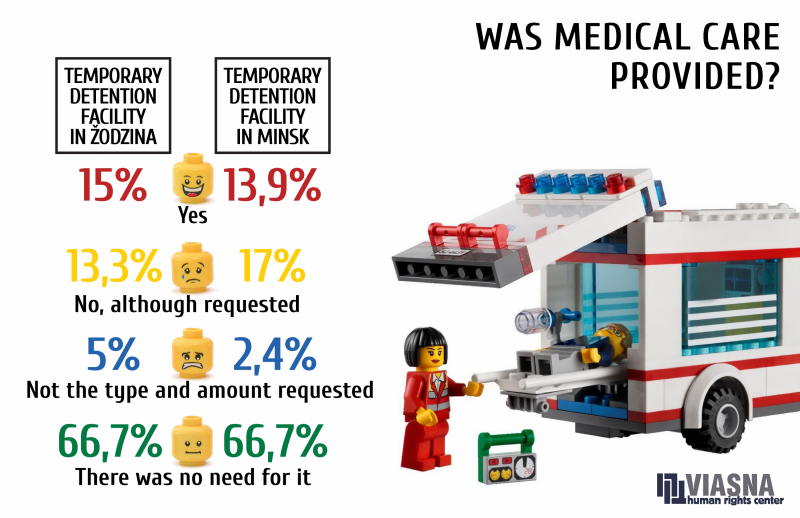 When admitted to the detention facility of Žodzina, medical examination was not carried out in 35% of cases. 30% of detainees were interviewed for health complaints. The rights of detainees were violated when they complained about health problems to employees of the places of administrative detention. There were instances when the administrations of detention facilities ignored requests for an ambulance (17%). 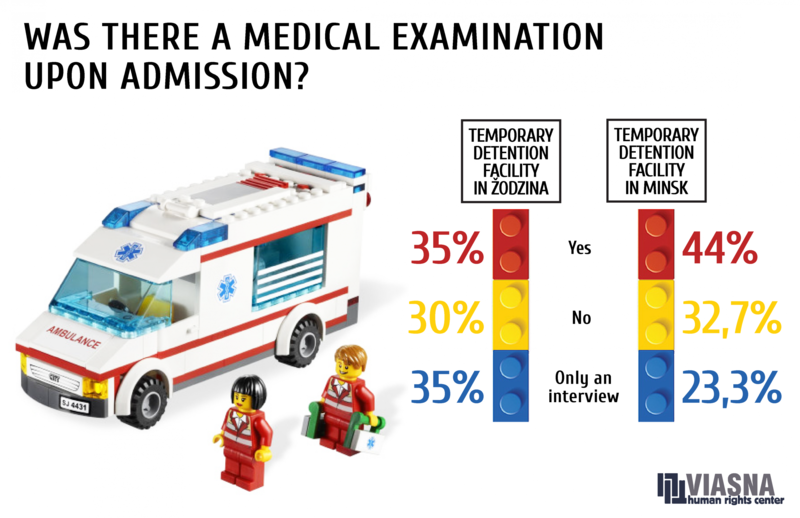 In the detention facility of Žodzina, 13% of interviewees were denied medical assistance. In 79% of cases, in violation of procedural law, the administrations of places of administrative detention did not notify the relatives of detainees about their detention, although, according to procedural standards, they should do this within three hours. 75% of the interviewees noted that during their transfer to the Žodzina detention facility, officials of the internal affairs agencies did not notify their relatives about changing the place of serving administrative detention. During the survey, 72% of the interviewees said that they were not provided with timely meals before the start of serving their detention. 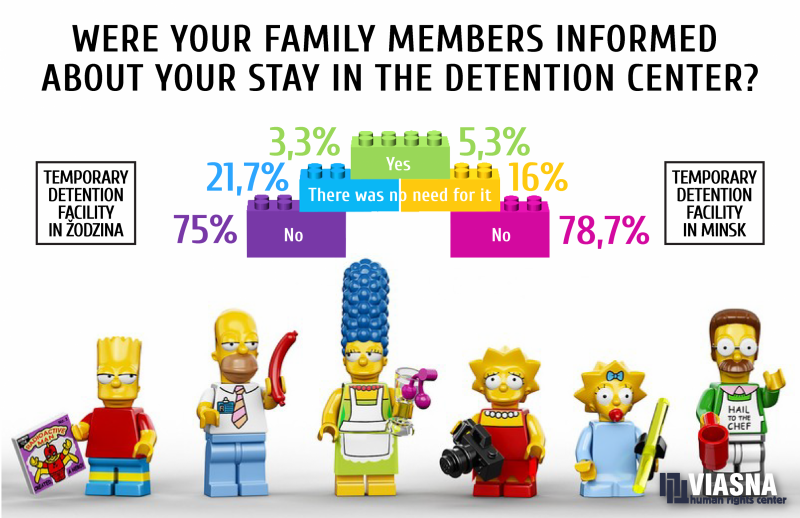 87% of detainees reported inadequate and unsatisfactory food quality. A grave violation of the prison rules are cases of serving meals by administrative detainees. Human rights activists documented 5 such facts. Sixty protesters detained in the run-up to the Freedom Day demonstration, on March 24, and those sentenced to detention in the trials on March 25 were transported to the detention facility of Žodzina, where they were held before starting to serve their sentences. The transportation itself took several hours, during which the detainees were held in cramped conditions, in the absence of fresh air, drinking water, food and the opportunity to visit the toilet. In the detention facility of Žodzina, administrative detainees were forcibly and without explanation subjected to a DNA test procedure. In addition, the cells lacked the possibility of maintaining intimacy when visiting the toilet, since the toilet was visible both to other prisoners and the prison officers. Administrative detainees complained about unsanitary conditions: damp dirty cold cells, lack of ventilation, terrible smell of sewage in the cells, inability to open a window, mold on the walls, dirty bed linen with stains and vermin, as well as vermin and mice in the cells. Numerous complaints dealt with poor ventilation (66%) and the sanitary condition of the cells (52%). After leaving the detention facility in Žodzina, 63% of the interviewees complained about poor sanitary conditions. The rights of administrative detainees were also violated when receiving parcels from their family members. In some cases, the contents did not coincide with the list (11%), or no parcel was received at all, although it had been submitted by the relatives (10%). 5% of the interviewees did not receive any parcels when serving administrative detention in Žodzina. As few as 21% of the interviewees were able to freely exercise their right to have the court ruling reviewed by a superior court in accordance with the law. 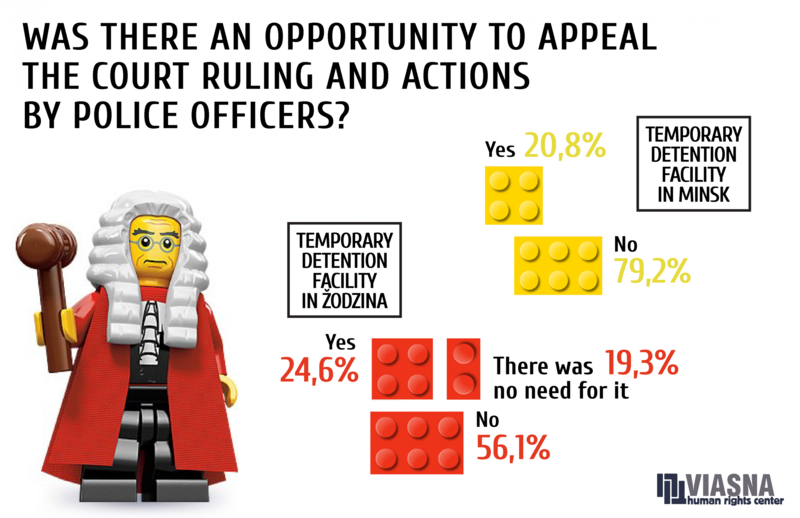 While serving detention in the temporary detention facility of Žodzina, 56% of the interviewees could not use their right to appeal against a court decision or actions of police officers. 27% of the interviewees did not have access to a lawyer. In addition, lack of access to a lawyer prevented some people from appealing against an administrative sentence, thus depriving them of the opportunity to exercise their right to appeal the court ruling. Article 5 of the Universal Declaration of Human Rights, article 7 of the International Covenant on Civil and Political Rights and the UN Convention against Torture and Other Cruel, Inhuman or Degrading Treatment or Punishment establish that no one shall be subjected to torture or to cruel, inhuman or degrading treatment or punishment. Article 21 of the Belarusian Constitution establishes that ensuring the rights and freedoms of citizens of the Republic of Belarus is the supreme goal of the state. Everyone has the right to a decent standard of living, including adequate food, clothing, shelter and constant improvement of the conditions necessary for this. Article 25 of the Constitution establishes that the state shall ensure freedom, inviolability and dignity of the individual. No one shall be subjected to torture, cruel, inhuman or degrading treatment or punishment. The Constitution of the Republic of Belarus guarantees the right to health care. The state shall create conditions for medical services accessible to all citizens (Art. 45); the state is obliged to take all measures available to create an internal and international system necessary for the full exercise of the rights and freedoms of citizens of the Republic of Belarus, as provided for by the Constitution. State bodies, officials and other persons entrusted with the performance of state functions are obliged within their competence to take the necessary measures to implement and protect the rights and freedoms of the individual (Art. 59). Article 62 of the Constitution establishes the right of citizens to legal assistance for the implementation and protection of their rights and freedoms. The Ministry of Internal Affairs should initiate changes to the internal regulations of places of administrative detention, making them more adapted to human needs, so that everyone can exercise their rights, and not be subjected to cruel and degrading treatment. Chief State Sanitary Doctor of the Ministry of Health Care should inspect the sanitary conditions of the places of administrative detention. The Prosecutor's Office should inspect the places of administrative detention, indicating the standards of occupancy, check the possibility and accessibility of administrative detainees to appeal against actions of employees of law enforcement bodies and court rulings, as well as remove barriers to access to a lawyer. Infographics by Nadzeya Shymbaliova. Information collecting and processing by Viasna's volunteer service.